In Logan, the titular Logan along with Professor X and Laura are traveling when they stop to help the Munsons, a family of farmers. Throughout the encounter, Logan and the others keep their true identity secret. The family offers them food and shelter and during dinner, it's clear that Laura is not normal as she eats with her hands at first and does not talk. How long has she been a mutant? Since Laura didn't exhibit any of her mutant powers, what made him think that she was indeed a mutant? They didn't think she was a mutant, they thought she was mute. How long’s your girl been that way? -Mangold, J. (Writer, Director), Green, M. (Writer) and Frank, S. (Writer). Logan. Final Shooting Draft Screenplay. August 2016.
because Laura didn't say a word during the meal. I thought I misheard it too, but in the scene she does nothing that would suggest she has a mutation. Not the answer you're looking for? Browse other questions tagged x-men-cinematic-universe wolverine marvel logan or ask your own question. 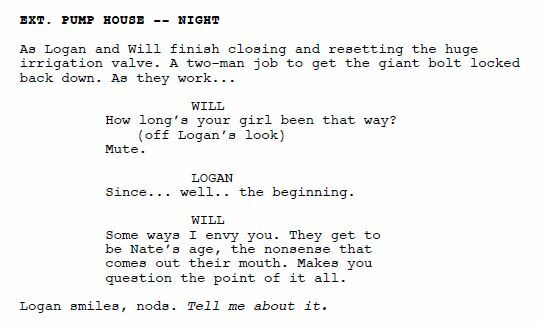 What is Logan really remembering from the time he was experimented on? What is Laura Barton's history? What is the track in the Logan (2017) trailer? What are the non-contemporaneous items or design choices in Logan? Was Xavier responsible for the Westchester Incident? Who was Rictor speaking to over the radio?